We are a team of dedicated animal lovers, passionate about creating happy, healthy and sustainable relationships between animals and their owners. Nine times out of ten, “problem dogs” are just good dogs suffering from a communication breakdown between them and their owners. We make it our business to help bridge this gap so that owners understand their pets, equipping them with the basic knowledge and respect needed to develop a good relationship with their pet. It takes a lot of discipline and dedication to care for animals the right way, and to make sure their lives are as fulfilled as they should be. We look forward to meeting you and your friend soon. Debbie has been training animals since 1986. 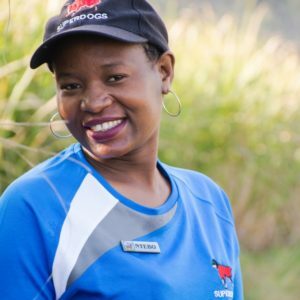 Working with animals is her labour of love and she is currently employed at uShaka Marine World as a senior dolphin trainer and show presenter. Her job has provided her with the opportunity to travel internationally, where she has gained extensive experience in marine mammal training. 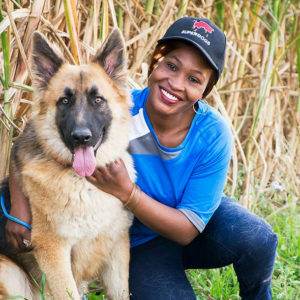 She has worked hands-on with fellow animal behaviourist to learn more about training principles and show presentation, voluntary medical sampling, water work, medicals, water chemistry, avoiding aggression and staff training. Debbie has also trained terrestrial animals (chimps and elephants) as well as beluga whales. Debbie is passionate about the ethical training of animals, to ensure a mutually fulfilling relationship with our animal friends. Teaching people about the importance of conservation is one of the many reasons she is so passionate about her career. 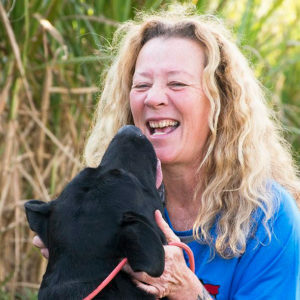 As a dog lover, dog training has always been a passion of Debbie’s. 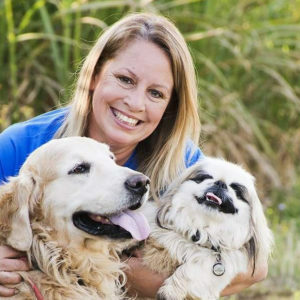 She has experience in working with “problem” dogs/owners, show dogs, advanced obedience, tracking, agility and protection. Thobani has lived in the Molweni Township for the last 8 years. Prior to this he lived in Pietermaritzburg. He has 2 little girls, aged 3 years and 5 years. 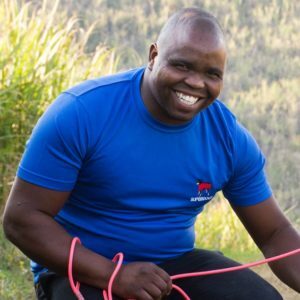 Thobani may have started with humble beginnings, however his skills as an animal trainer have grown to the point where he has been asked to consult internationally. He has even done show business. He has trained dogs to take part in stage shows. 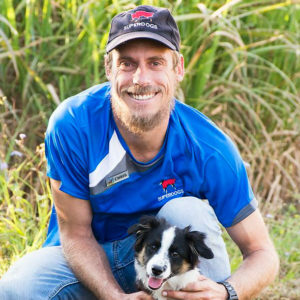 This professional dog trainer is an incredible asset to Superdogs, and to you. Thobani is primarily involved in our in-board training program and he occasionally assists with classes. Another primary responsibility is working one on one with In-board trained dog’s people. Assisting them to work with their dogs to achieve the same responses as he does. I am Nteboheleng Shozi. I am 26 years old I used to live in Eastern Cape but now I live in KZN because of work. Not sure if I can call it work because it has become my passion. When I began I thought this was just a job. Now I am in love with dogs. I love working with animals. My love for dogs increases every day. Working or rather playing at Superdogs is a dream come true. A dream I did not even know I had. Bilal Limbada is a young charismatic family man who has almost 10 years of animal experience and training. He has inspired many to conserve and take care of our environment however, his true passion lies in animal training. He has worked with dolphins, seals, penguins and other birds and has been taught by world renowned trainers. 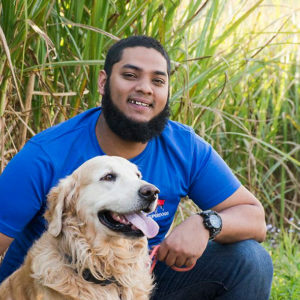 Bilal has huge ambition and is a great trainer who strives to improve relationships between man and man’s best friend. Animal behaviour has interested and perplexed humanity for centuries and a desire to understand why animals do what they do has resulted in vast amounts of research being conducted on the topic. Having been an animal trainer since 1990 and being surrounded by animals her entire life, Gabby Harris offers a new and astonishing way of viewing animal behaviour and what humanity can learn from the animal kingdom if they simply remove the science and open their hearts. The key ingredients of success are compassion and understanding. Gabby does Superdogs house calls and works on building understanding and relationship between owner and owner’s best friend.